The Tropical Bird House was sited in perhaps the most commanding position of all the Tecton buildings. Set east of the castle on a steep, east-facing site, with views out over the wooded slopes to the north. It was built to house semi-tropical birds, such as parrots, and incorporated a heated indoor house and an external balcony, which allowed some of the birds to be displayed outside during summer. Unlike the animal houses closer to the castle, the Tropical Bird House was in a less sensitive site, and this enabled the architects to create a bolder design without significant height restrictions. The two-storey building thus created was something in the manner of a belvedere, its drum form and hilltop location recalling the use of such towers in C18 English landscape design. The steep site, with the ground falling away sharply to the east, served to link the two levels within the terraced grounds, in common with the other large animal houses designed by Tecton for the site. The upper level, which was the expected approach from the south, gave access into the tropical bird house and surrounding balcony which cantilevered out over the paddock below. This allowed not only a view of the bison in the enclosure, but also over a wide area of the zoo grounds. A flight of steps gave access to the area immediately below the house, where the cantilevered balcony doubled as a shelter for visitors in wet weather. 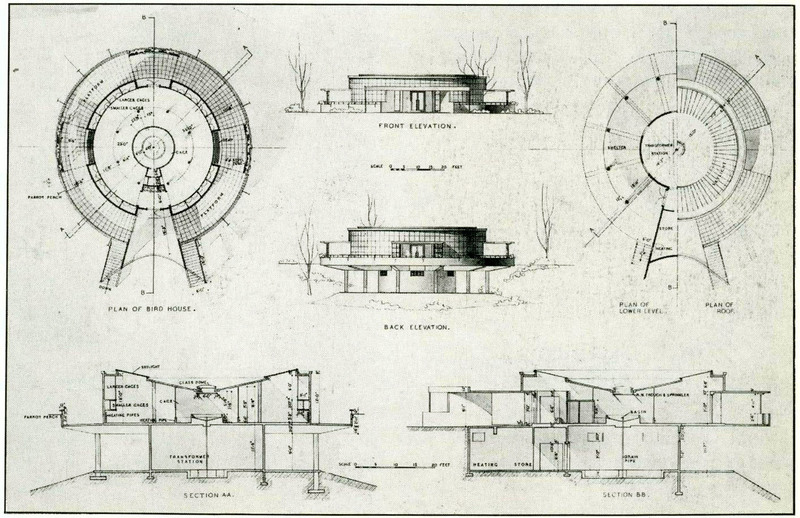 The central drum beneath the main house provided a discreet location for an electricity transformer station. The design of the building was impressive for its engineering and spatial qualities. The reinforced concrete roof, in the form of a partial inverted flat cone carried on plain columns, was structurally separate from the circular external wall, and the two were united only by the double-glazed roof light which bridged the gap in an unbroken circle. Historic photographs show the interior flooded with light. A circle of wire mesh drops down under the central roof cone creating a large aviary. Large and small, white-tiled, mesh covered enclosures lined the exterior wall of the entire structure from one side of the entrance to the other. The tropical bird house is no longer used for its original purpose. The paddock beneath now houses Asiatic lions.